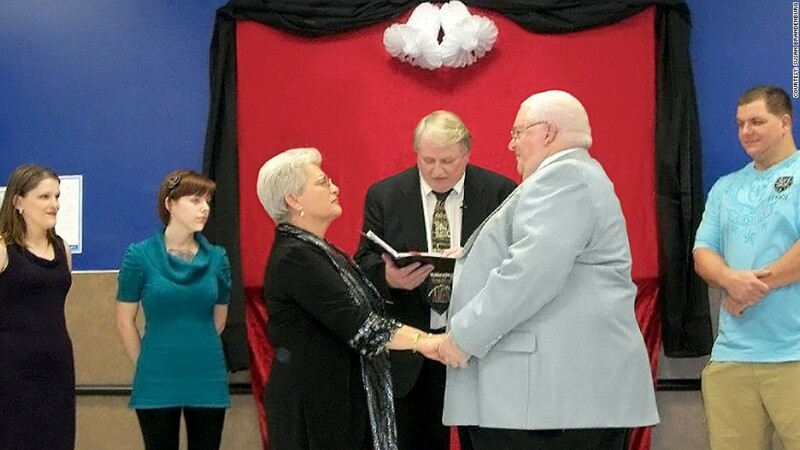 Susan and Wayne Brandenburg said 'I do' in the North Carolina Wal-Mart, where the couple met. For years, Wayne Brandenburg shopped at his local Wal-Mart three or four times a week. He never thought he'd pick up a wife, or marry her, there. Last February, Brandenberg and his bride Susan, both in their mid-sixties, said "I do" in the layaway section of the Shallotte, N.C., Wal-Mart, just a few feet away from where they first met around 2005. Susan worked as a cashier, after having gone through a difficult divorce. Wayne, whose wife had passed away, made sure to get in the line at her checkout counter, just so he could say hello. "I'd ask her how she was that day, and tell her she looked very nice," he said. Susan said that she felt safe with him and that he seemed very kind. Wayne asked her out for a Chinese buffet dinner on their first date. She brought along her two daughters and he brought his two granddaughters so that Susan would feel comfortable. Wayne had a full beard and looked like Santa Claus, he said, which made him an easy sell to the kids. After that, Wayne started making her lunch every day and bringing it to the Wal-Mart (WMT)store. "He was very much a gentleman, and I looked forward to seeing him," she said. A year later, Wayne proposed to Susan. He couldn't kneel down because of his bad knees. So he handed her a diamond ring and asked her to marry him. Susan said she shouted something like "don't you do that," only peppered with expletives. She came around to the idea shortly after. The couple was engaged for six years. When they finally settled on a wedding date, Wal-Mart was the natural choice for the location. "I first said it as a joke," Wayne said. "But we batted it around and realized that it's where we met, where we dated and where most of her friends worked, so we asked the store and they gave us their blessing." One of Susan's coworkers bought the wedding cake from the store's bakery. Her daughters jazzed up the cobalt blue walls with bells, lace and ribbons bought from the home decor aisle. Hordes of Wal-Mart staff joined in and cheered when a local pastor said, "You may kiss the bride." "That kiss was the most special part," she said. "I feel thankful to Wal-Mart for bringing us together. It's the best thing that ever happened to me in my life." Related: The wedding is off! Who gets the engagement ring? The Brandenbergs aren't the only people to find their match under the halo of Wal-Mart's fluorescent lights. A study of "missed connection" posts on Craigslist, where lovestruck hopefuls try to track down a stranger who caught their eye, found that Wal-Mart is the most popular place to find love at first sight, according to Psychology Today magazine. Wal-Mart spokeswoman Ashley Hardie said the nation's largest retailer is flattered to be a place where picking up something as mundane as milk can lead to something magical. "Perhaps the saying should go, 'love comes when you least expect it -- or when you go to Wal-Mart,'" she said.